Dr. Christopher O’Connor is the Richard Stack Distinguished Professor of Cardiology and a professor of medicine at Duke University, which he joined in 1989. 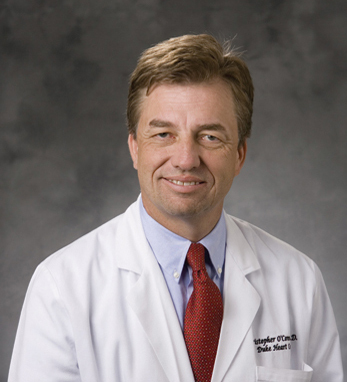 He is also chief of the Division of Cardiology and the director of the Duke Heart Center. A leading researcher in the field of cardiology, Christopher’s findings have been influential to the world of medicine having been one of the principal investigators of the landmark HF-ACTION clinical trial, which studied exercise training in heart failure patients and led to international changes in cardiac guidelines and rehabilitation. Christopher was born in Takoma Park, Maryland and is a third-generation Irish American with ancestry from Killarney on his father’s side. His Irish ancestry, he says, “has given me the willingness to achieve excellence in a socially responsible way,” and has guided him throughout his life, beginning with his first job as a lifeguard and throughout his career. Christopher earned both his B.S. and M.D. at the University of Maryland, strengthening the qualities of what he finds to be in a good leader: vision, listening, and making decisions with transparency. These qualities have also been useful in Christopher’s other leadership roles with the Heart Failure Society of America and the American College of Cardiology. He currently lives in North Carolina with his wife Sue and their children Ryan, Erin, Sean, and Kyle.